It is coming up to 4 years since Android Auto was first announced at Google I/O, with the app released nearly a year later. 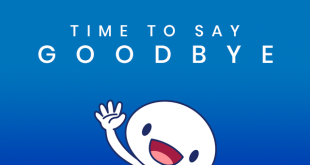 Since then, the platform has seen a very slow uptake by the general public. Early on, Android Auto was beta at best with much functionality making it more onerous to use it than not. In the past year or so, Google has made some big changes to Android Auto resulting in a much improved user experience but there has always been one thing missing, something that was mentioned nearly two years ago — wireless Android Auto. Now it is here. Finally. Having to plug your phone into the headunit puts far too many barriers in the way of Android Auto working. The quality of the USB cable and the connection at both ends has a large impact on whether Android Auto works or not. Another factor having a bearing on your frustration levels is the phone’s software itself. I’m not sure what Google have done, but Android Auto works amazingly well with any phone running a lean, non-skinned or lightly skinned version of Android. Try and use it with a phone heavily skinned and there will likely be issues — both LG and Huawei phones are well known for sketchy Android Auto compatibility. Hopefully having a direct Wi-Fi connection to the headunit without any USB cable or software USB implementations to get in the way will result in a much more consistent connection and thus experience. This is where Google need to be. Android Auto needs to work with all Android Phones — it would be a massive step from Google if it worked with iPhones too (I’ve used Apple CarPlay and it is a dog’s breakfast of functionality that is not required and over-complicating things- don’t get me started on Apple Maps either). Google’s announcement, via the release of several wireless Android Auto head units, that wireless Android Auto was finally here is a big step for Android Auto and will hopefully lead to many more users. We all know what many more users means? More apps, more functionality. We saw all the big players in aftermarket car entertainment fire their first shots of 2018 for your next Android Auto head unit. Alpine, JVC, Kenwood, Pioneer and Sony were all present, representing a large Android Auto presence at CES 2018. I have some Alpine equipment in my car, but what I am most waiting for is a 9 inch capacitive display that runs wireless Android Auto. Alpine were so close to this with the announcement of the iLX-F309, an innovative head unit that can bring the 9 inch display to many cars without the requirement of to modify the dash. The 9 inch, capacitive WVGA display “hovers” above the dash while the mount for it sits in the dash in a single DIN. the display can also be move forwards or backwards and tilted up or down 45 degrees each way. Unfortunately it still requires a USB cable to connect your Android phone to the head unit but we hope that Alpine are just waiting for the technology to mature before offering it in their head units — they were late to the Android Auto party as well. Hopefully by this time next year we can all have a 9 inch wireless Android Auto installed into our cars (if we wish to, and let’s be honest, who doesn’t?). At US$1100 it will not be a cheap head unit but for a 9 inch display and revolutionary install method/size it is something to consider. 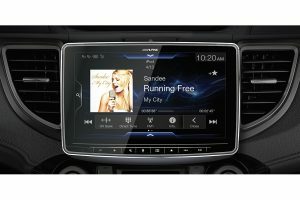 Sony have their fingers in so many pies it is hard to keep up with them but they do make decent kit and the new Android Auto head unit they announced at CES 2018, the XAV-AX5000, looks to be just that. The new head unit is a move away from the large side bezel and lower bezel that previous Sony Android Auto head units have had. This one is a decent 6.95 inch display compared to the previous 6.4 inches. Sony are calling it bezel-less, and while their definition of bezel-less is different to mine and yours (maybe it is different in the car audio world) it is a much smaller bezel, allowing for the bigger display and still fitting within a double DIN size. The XAV-AX5000 is already on the Sony Australia website with an “available soon” tag. The head unit is a stylish design, less of the blocky industrial design that so many other head units have. It is a big step for Android Auto to move into something so stylish — hopefully the other manufacturers follow suit. While it’s great to see Sony changing the display up, and to be honest, this looks the most stylish of all the head units announced, the Android Auto connection is still through a USB cable. If Sony had made this a wireless I would already be lining up to install one in my car. Pioneer went a bit under the radar at CES this year and with very little fanfare they announced a pair of head units that support not just the new Google Assistant on Android Auto but wireless Android Auto. The also mentioned that ALL of their future Android Auto head units will support wireless Android Auto. At this stage the head units are still in the prototype stage and thus details on the two models, AVIC-W8400NEX and AVH-W4400NEX are very sparse aside from both having a 7 inch display. With the head units still in development there are obviously no details on when they will be released or where or for how much. 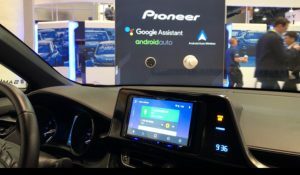 Given their statement that all their future units will support wireless Android Auto we are confident that we will see some Pioneer wireless Android Auto units in Australia this year. Although JVC and Kenwood are essentially the same company now their products are still separate, with Kenwood seemingly being the more premium products and for this reason I will mention them separately. I like JVC, a lot. I have used their head units in my cars previously and feel that they offer great bang for your buck. 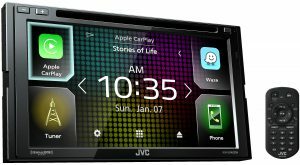 With JVC’s CES 2018 Android Auto announcements it seems like they are going to be continuing this tradition this year with some decent, albeit under-specc’ed, head units. We had word prior to CES that Kenwood would be announcing a couple of wireless Android Auto head units and it turned out that together they released a lot more than two — JVC revealed two wireless Android Auto units themselves. The two wireless units unveiled by JVC are the KW-V940BW and the KW-M845BW. Both have 6.8 inch displays and all the usual specs you are looking for including digital radio but unfortunately both are a resistive display. At this stage there are no details on Australian availability or pricing but with the higher end KW-V940BW RRP in the US at $699.95USD you would expect the Australian price to be very affordable (for a head unit of this type). The big step here is that JVC are releasing a pair of wireless Android Auto head units at what promises to be competitive pricing. For me though they are let down by the display. It is safer to have a display that reacts quickly and consistently to each and every touch on it to keep your eyes off the road. It is for this reason that my next Android Auto head unit will have a capacitive display (and be wireless). Luckily Kenwood have me covered. Kenwood really hit the ball out of the park at CES this year, progressing Android Auto along more than any other manufacturer. Not only have they announced various Android Auto head units but have included two that are not just wireless but have a HD capacitive display. All of the other head units have WVGA resolution so the jump to 1280 x 720 display resolution is an evolution, if not revolution. Kenwood are the first brand in the market launch a HD display range with the display being of such a quality that it allows for wider viewing angles. Some current Kenwood Android Auto models already have Wi-Fi functionality but they are not optimised for wireless Android Auto and whether this can be added via a firmware update is unknown at this stage but the option is possibly there. We have reached out to Kenwood Australia and they have stated that wireless Android Auto is something they are definitely looking into but cannot share their plans with us just yet — the “Aussie equivalent models are yet to be announced”. Their 2018 catalogue and general information will be available in February. 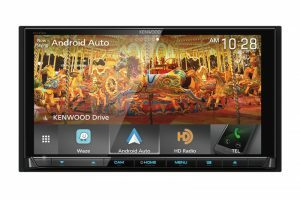 While the design is much of the same as previous models, the implementation of wireless Android Auto and a high definition capacitive display have put Kenwood at the top of the heap. We will hopefully have one landing on the Ausdroid Review bench (my car’s dashboard in this case) in the coming months. At this stage we are unaware if or when any of these wireless Android Auto units will make it Downunder but I will be first in line to check them out. Wireless Android Auto, full Google Assistant integration and HD displays are just the start of things for this year for Android Auto. It is seeming likely that 2018 will finally be the year Android Auto makes the step it needs to become the solution so many of us are looking for. This popcorn looks awesome, it is suitable to both watch movie and eats it. Some current Kenwood Android Auto models already have Wi-Fi functionality but they are not optimised for wireless Android Auto. Fantastic Write Up Scott! (I have said it before, but I will say it again, ausdoid has the absolute best coverage of Android Auto). I instantly fell in love with the 9 inch Alpine Unit, but as someone who is pained by the “Android Auto can’t connect right now” screen, I loathe the USB connection and I am ready to embrace wireless. Hopefully my next phone can get QI Charging inbuilt too, for a truly wireless experience. (mind you, I don’t look forward to the heat of wireless charging + active wifi radio and cpu -driving mirroring). Hd is such a big achievement? In the car audio world they are always few years behind and many dollars more than other tech.